and what if you could see results as soon as 90 days? Ronnetta Griffin, aka the “Iron Queen,” can help you make that a reality. 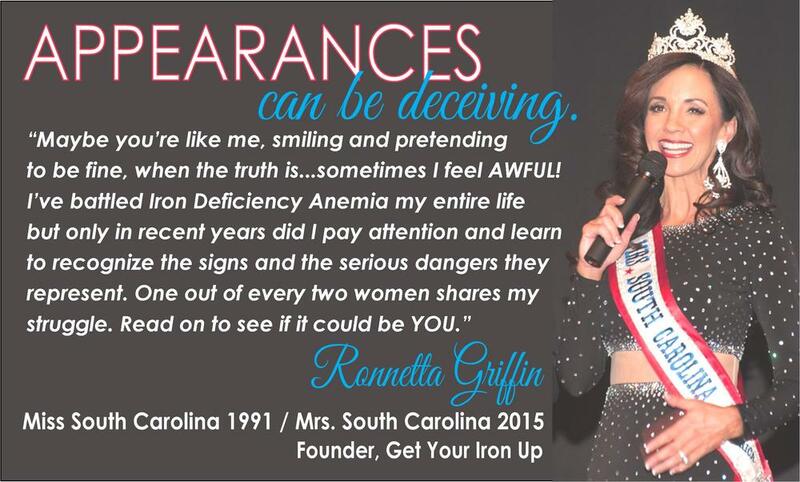 Ronnetta is one of only three Certified Iron Educators in the world and the only one who specializes in Iron Deficiency Anemia. She’s the most sought after expert, consultant and speaker on the topic. Most importantly, she's a chronic Iron Deficiency survivor who suffered for decades without knowing the cause. She nearly died, coming dangerously close to hear failure, because she didn’t recognize the signs. Get Your Iron Up was born from her desire to help others who are going through the same struggle. Not long ago I was where you probably are right now -- sitting at a computer searching the Internet for answers. After finally connecting the dots and begging for a diagnosis, I vowed to research, study, network and do all I could to combat this epidemic. I partnered with the experts in the field of iron disorders. I became one of the world's first-ever Certified Iron Educators. I competed for the title of Mrs. America in order to use that platform to gain media attention and reach more women across the country and the world. Through social media and the Internet, I have become known as the Iron Queen. I think that's pretty amazing considering that this all started with a single landing page to explain to my friends why I had stepped back from my volunteer activities and PTA responsibilities when I was at my lowest point medically and emotionally. I'm so glad that you discovered what has evolved into a trusted educational source of information and I hope you'll find it to be a valuable resource in your journey to identify, treat and take control of Iron Deficiency Anemia (IDA). Here you'll find accurate and reliable information backed by my friends at the Iron Disorders Institute (IDI) -- a panel of world-renowned experts in the fields of medicine and science who make up the IDI Medical and Scientific Advisory Board. Iron Deficiency Anemia is very serious. In fact, it's as serious as a heart attack, but did you know that IDA can actually lead to one? Your research and perhaps even your doctor may not have explained this to you. On this site, I have taken the available research and information and presented it in patient-friendly terms, with the emphasis that it deserves, because I understand how valuable your time is and how important it is for you to fully grasp the dangers of IDA. It's time to finally take IDA seriously -- there's just NO reason to feel exhausted, weak, cold, breathless, irritable, depressed and in pain one minute longer! My goal is to help you break the cycle that far too many IDA patients experience...they receive the diagnosis, try an iron supplement, experience pain and discomfort, stop taking the supplements and ignore the anemia. The downward spiral begins. While IDA is indeed serious, it's not impossible to manage. Your primary care provider, or possibly a hematologist (blood specialist), will prescribe the treatment that's best for you. Many times it's a process of trial and time to wait for results. For some patients, all it takes is some basic nutritional knowledge coupled with simple dietary and lifestyle changes to see an increase in iron levels. For others, properly taking one of the many oral iron supplements on the market (each with a different delivery system) can help to raise iron levels. Still for others who sometimes don't respond well to oral iron, have malabsorption issues, or whose iron deficiency is so severe that other methods would take too long to be safe, IV Iron Therapy might be the best choice. Again, while I'm not a doctor and can't give medical advice, I will share my personal experience to hopefully help you find some direction. Perhaps the best part of getyourironup.org is that it's personal. There are so many other websites out there that are too clinical and difficult to understand. GYIU is relatable. Please take time to browse this site to view the videos and read the stories and articles that highlight people's personal journeys with IDA. These stories bring the disorder to life in an effort to allow more people to recognize themselves when seeing the symptoms and signs from a different vantage point. This will hopefully lead to better diagnosis and management of IDA and healthier living for YOU! I hope you will consider submitting your story. I would love to share it. That's how we can help each other and continue to pay it forward. IT'S TIME TO GET your iron up! I hope you'll find the answers you're searching for and the good health you deserve. Be sure to subscribe, follow me on social media and check back frequently! I am sorry that you are struggling and suffering, but I am so glad that you have found the Iron Queen community. You're NOT alone! Help me to help others. Please share your IDA experience by answering the questions below that apply. None of the answers are required in order to submit - share only what you feel comfortable with. If you choose to include your contact info, it will remain private. Thank you! Where are you in your Iron-out-of-Balance® journey? Suspicious that I may have IDA, but have not seen a doctor yet. I have been diagnosed with IDA but I am not doing anything to treat it. I have been diagnosed with IDA and I am undergoing treatment. I have been diagnosed with IDA but cannot afford treatment. I have been diagnosed and treated for IDA in the past and I'm having trouble again. How old were you when you were first diagnosed or believe that you began having issues related to IDA? Have you taken oral iron supplements before? What oral iron supplement brand(s) worked best (and had the fewest side effects) to get your iron up? What oral iron supplement brand(s) did NOT work well to get your iron up? If you have taken oral iron supplements, what side effects, if any, did you experience? Have you ever had a serious adverse reaction to oral iron supplements? If so, please describe. Have you ever been prescribed and received IV Iron Infusions? If so, what brand(s)? Did you experience any side effects after receiving IV Iron? Have you ever had a serious adverse reaction to IV Iron? If so, please describe. If you have received IV Iron, did it work well to get your iron up? How soon or often did/do you have to repeat IV Iron treatment? Have you ever had a blood transfusion to treat low hemoglobin due to iron deficiency? If so, did you experience any side effects? Have you ever had a serious adverse to a blood transfusion? If so, please describe. Do you have an amazing "Iron Smart" physician you would like to recommend? Your input will help me to help others. Please let me know how you found this site. Thank you so much! Subscribe below to make sure you're on the list for my exciting news coming very soon! You asked, and I listened. After years of hearing from women like you who have been asking, begging for a great solution for iron deficiency, I am so thrilled to soon be unveiling ironology health solutions™. My partners, also iron experts and iron educators, and I can't wait to share it with you! Join my mailing list to receive updates about Iron Deficiency Anemia events, news, research, and support groups. Your information will not be sold or shared with third parties. I never wanted to promote any company's products for fear that it would somehow lessen the authenticity of my message. I simply could not vouch for something that I did not fully believe in. In fact I resisted for more than six years. But day after day, I have continued to receive your heartfelt emails and social media messages literally begging for help. Overwhelmingly, the #1 question has been, "what iron supplement works best with the fewest side effects?" I realize that not everyone has access to IV Iron or even the proper nutrition that they need. There is another way, and that is why I have been studying, researching and developing this product with my partners for YOU, the Iron Queen community and all who suffer with Iron-out-of-Balance®. Along with Cheryl Garrison, Executive Director of the Iron Disorders Institute, and David Garrison, creator of Hemochromatosis.org, I have formed a company focused entirely on discovering solutions for people suffering from Iron-out-of-Balance®. I'm so proud to announce that IRON LIFe LLC will be launching its new brand, ironology health solutions™, in the Fall of 2017! We'll begin with our two core products that will boost ferritin (for iron deficiency with or without anemia) or block the absorption of iron (for hemochromatosis iron overload). On the heels of that roll-out, we'll be offering a series of equally important products (now in package design) that will make up the first total wellness system created specifically for people with Iron-out-of-Balance®. When iron is not balanced, it directly impacts other levels in the body. Unless you are also addressing those, you're not likely to see the results you hope for. YOU actually helped develop this new iron supplement. Since its establishment in 2012, GetYourIronUp.org has been accessed by an average of 5000+ visitors each month. Over the past five years, the site has featured an online survey to gather information from IDA patients just like you. Thanks to your help and input, we have reviewed your opinions and this product comes from the guidance you provided. So, for the first time ever, I am endorsing an iron supplement. It's a product and a regimen that I have personally used with great results -- increased iron levels and no side effects. It's easily absorbed and more bio-available than most other iron products on the market. It has worked for me and I hope that it will work for you as well. I recommend trying it for at least 90 days. Anything less would not give it a fair chance at doing its job. Think of it this way...even with IV Iron Infusions that pump your body full of immediate iron, it can still take weeks or months to see results. So taking iron supplements is a slower process, but the results can be dramatic if taken properly. Consistency is key, and for that reason I designed the Get Your Iron Up pill organizer (which will be my gift to you with your first purchase, while supplies last) to help keep your regimen on track. Be sure to sign up so you'll be among the first to know when we launch ironology health solutions™!